Quiche is one of those meals that we have pretty regularly at our place. 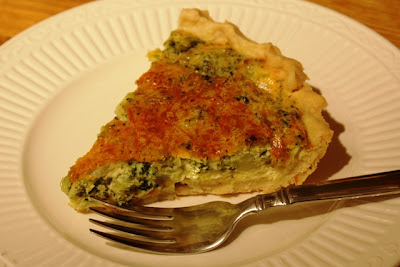 Yes, my husband AND kids like quiche. My girls like to call it "Eggy Pie." It is a great meal to make because it's economical, and I usually have all the ingredients in the fridge. Oftentimes, I'll make two at a time -- one for dinner and one for my contribution to my MOPS brunch the next morning. I find that it makes a good meatless contribution to a buffet. If you make it ahead, just reheat it in the oven at 325 degrees for about 15 minutes. Prehead oven to 375 degrees. In a pan, melt butter and cook onion, garlic and broccoli until soft. Season with 1/2 teaspoon salt. In the bottom of the pie crust, layer 1/4 cup cheddar cheese and 1/4 cup parmesan cheese and press down firmly. Spoon on the broccoli mixture and spread evenly. Top with the remaining 1/2 cup cheddar and 1/4 cup parmesan. In a bowl, combine eggs, half-and-half, dried parsley, 1/2 teaspoon salt and 1/4 teaspoon pepper. Carefully pour into pie crust. Bake at 375 degrees for about 45 minutes. For other meatless recipes, be sure to drop by Life as Mom today for Ultimate Recipe Swap. I love broccoli and cheese!